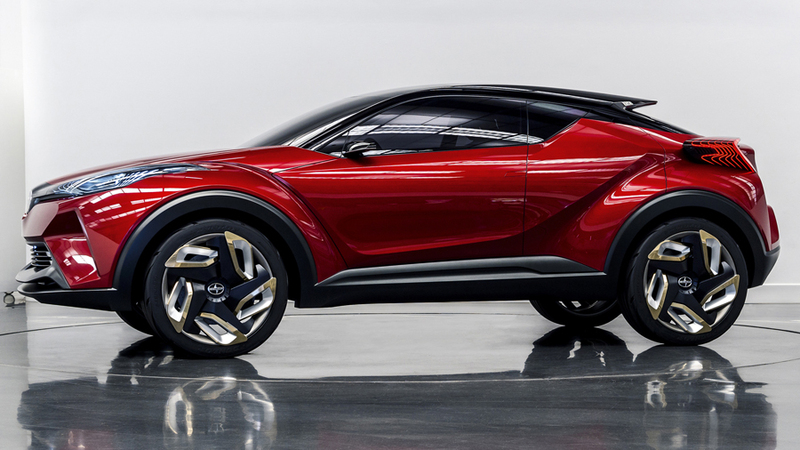 The Scion C-HR Concept car is named for its Compact size and High Ride height. With four doors and a hatch , it’s the perfect vehicle for young urban creatives. Taking inspiration from a diamond with sheered sides, the C-HR cabin is like a precision-cut gemstone. From the overhead view, the diamond points have been sharply cut in the front, rear and sides, giving view to the round fender flares visible from every angle of the car. The lower body is sensual and instills strong emotions while the chiseled, faceted cabin suggests protection, giving the C-HR contrasting features that satisfy two desires. Graphite black accents on the grille, rear bumper, fender flares and lower side panels reflect the strength and stance of the vehicle. Meanwhile, the all-piano black roof enhances the C-HR’s sleek and stylish profile. The increased body rigidity reduces body movement and roll in cornering. This allows for better ride comfort while maintaining dynamic performance. Improvements will be felt through responsive handling, agility and straight-line stability.